Cut the cucumber in half lengthways and scrape the seeds out with a spoon. Slice into 5mm crescents and tip into a bowl. Cover and chill. Whisk together the mirin, vinegar, sugar and 2ablespoons of the sesame seeds in a bowl. Season to taste with salt and pepper. Pour the vinaigrette onto the cucumber and return to the fridge for a further 30 minutes. Drain through a fine sieve, reserving the dressing. Return the cucumber to the bowl, and stir in any sesame seeds that may have collected on the bottom of the sieve. Add more salt and pepper if necessary. 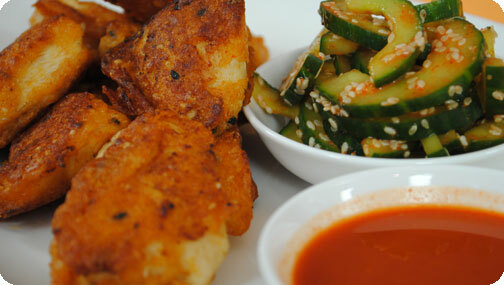 Put the gochujang in a small bowl and whisk in the reserved dressing from the cucumber (there should be about 75ml). Add the remaining 1 tablespoon of sesame seeds. Taste and add more chilli paste or sugar if you like. Pour into small dishes. In a bowl, mix together the matzo meal, flour, salt, cayenne pepper, paprika, sesame seeds, togarashi, gochugaru, gochujang and onion powder. Stir in about 500ml of ice-cold water to make a loose, thin batter. Whisk well to remove any lumps. Dip each piece of chicken in the batter and fry in batches in the oil for about 6-8 minutes. Remove from the pan using a slotted spoon then pop into the hot oven and bake for 10 minutes. Serve the fried chicken on plates with a small bowl of the dipping sauce and cucumber salad alongside.